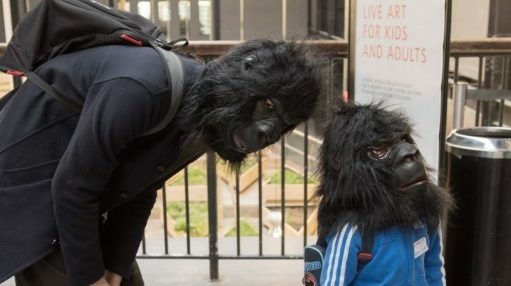 Playing Up is an artwork by Sibylle Peters (of Theatre of Research, Germany), facilitated by local artists Caroline Meaden and Will McBride, exploring the potential of Live Art to bridge generations. Drawing on key Live Art themes and seminal works, PLAYING UP takes the form of a game played by adults and kids together. Kids are explorers of the everyday. For them to light a match can be something extraordinary that needs focus and time and creates an experience. Playing up is part game, part artwork, part learning recourse. It comes as a box set of 37 cards, each describing a different work of Live Art alongside an instruction to interpret some of its ideas. The live bodies are the players – the children and adults. A short description of Marina Abramovic’s “Freeing the Voice” (1976), for example, is followed by the instruction: “Set an alarm to go off in five minutes. Lie down on the floor with your heads tilted backwards. Start screaming, and don’t stop until the alarm goes off.” The rules of this game are simply to follow the rules, which are less like rules and more like permissions. The real secret is that anything could happen. Children, grown-ups, families and friends are all welcome. Pick a card, follow the instructions, create your own piece of Live Art, and perform it.